A Diamond Select Release! By the power of Mjolnir! The Asgardian God of Thunder returns to Midgard - and the Marvel Gallery PVC line - in the form of this electrifying diorama! 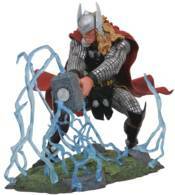 This sculpture of Thor in his modern garb captures him mid-strike, with lightning coursing through his hammer Mjolnir and into the ground. Made of high-quality PVC with exacting paint details, this 8-inch sculpture comes packaged in a full-color window box. Designed by Caesar, sculpted by Mat Brouillard.